Long Stemmed, Rich Red Roses accented by Fragrant Stargazer Lilies traditionally designed in a classic red vase. Shown at our PREMIUM level. 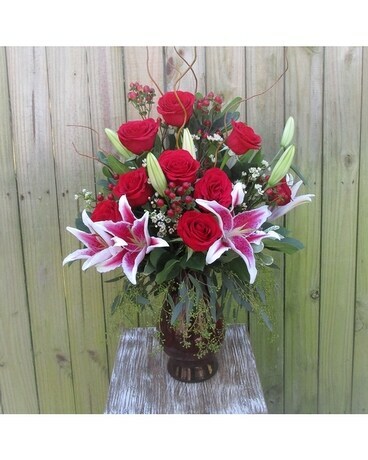 Premium includes 12 Red Roses accented by Stargazer Lilies. Red Roses, Oriental Stargazer Lilies, and accenting foliage. Delivered in a gold urn Orientation: One-Sided Size: 28 Inches Tall, 18 Inches Wide for either level.